Hopefully I will have a completed top to show you by Sunday. Let's just say this is a bit louder than anything I have done before, but I am L-O-V-I-N-G it! I really like the way you've fussy cut the fabrics. see, i could never put those fabrics together, but i love it! it looks SO good. p.s. while we love seeing elliott and emma, we really miss the rest of you. I'm like Stephanie--I would never put those fabrics together, but whatever and wherever they end up being, they will be the bright spot! Cute! 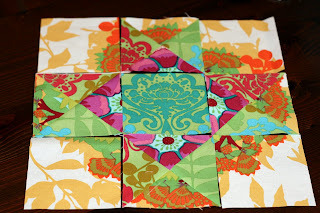 Ooohhhh, how exciting that block looks -- can't wait to see the rest of them!